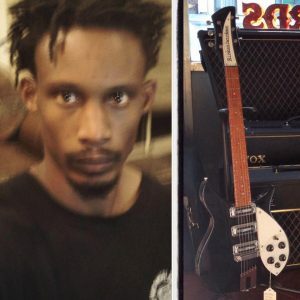 STOLEN GUITAR ALERT: Please be on the lookout for suspect Steven Maurice Shamburger and our 1997 Rickenbacker 350 guitar SERIAL# W04716. Guitar was stolen from Caveman Vintage Music sometime between 2/28/16 and 3/13/16. Suspect is 29 years old, last place of residence was in Palmdale. Please contact Caveman Vintage Music at 323-505-7777 if you have any info. Call CAVEMAN VINTAGE MUSIC AT (323)505-7777 for more info.